This process is fairly simple, but attention to detail is key. All you need is a flat surface, such as glass or plexiglass and sandpaper. A word of warning: plexiglass can warp. Don’t leave it by a window where it may get baked in the sun. Because of this danger I only use glass(3/8 inch thick or thicker). Make sure the glass edges are beveled smooth for safety. I usewet/dry 220 grit sandpaper. Many people sand the back of the blank as the very last step. I have found that sanding it right after planing and before shaping is best. Because the cane has not been shaped yet, it has a wider footprint and gives you more stability when sanding. If your planner is set up properly and all went well the blank should be almost perfectly flat. It will only need a little work on sand paper to finish it off. If the blanks are far from flat, the sanding process can be the most time consuming and treacherous step of the entire reed making process which is why I strongly advocate extreme attention to detail during the planing step(sharp blade, proper blade depth, reed height set correctly etc) to achieve the flattest results before sanding. If the blank needs to be sanded too must during this step, it will be impossible to keep consistent blank thicknesses, because by the time the blank has been sanded flat, the thickness has been changed drastically. 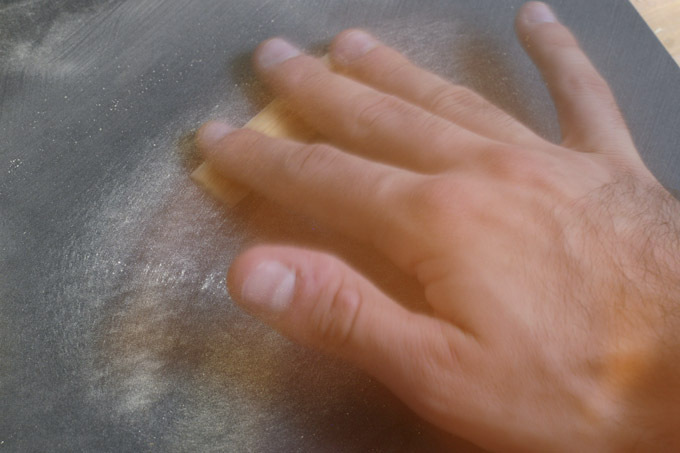 Lastly, if your blank is far from flat to start with, it is almost impossible to sand it flat because of the unavoidable rocking motion with each stroke. I use double sided tape to secure the paper to the glass. Be careful to make sure it’s perfectly flat with no grit trap under the paper. Hold the cane lightly to the paper and sand in a circular motion. There is some debate over which motion is the best to use when sand, but I’ve found any motion works just fine if you keep a light touch. Some reed makers use double sided carpet tape between the reed and the fingers to get a better grip. With a little practice, it’s fairly easy to do with out the tape. Each piece of sandpaper tends to last about 40-50 reeds. When you are done check your work on glass.